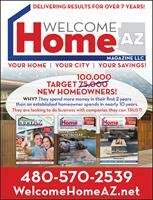 Welcome Home AZ Magazine targets only new homeowners! All of these people are new to their neighborhood, and most are new to Arizona. They are all looking to establish new relationships with companies they can trust. Over the past seven years, Welcome Home AZ has mailed over 4.6 million copies of Welcome Home AZ Magazine to over 480,000 of the newest homeowners in the Valley. Collectively, these new homeowners have made nearly 100,000 phone calls to Welcome Home AZ Magazine Advertisers and thousands of projects have been completed with companies they can trust!